INDUSTRY SPOTLIGHT A New Maestro for Chopin Tad Dorda, one of the brand’s original owners and the man responsible for bringing both Chopin and Belvedere to the U.S. in the late ‘90s. C Dorda, whose family owns the historic Polmos Siedice distillery in Poland where Chopin is made, bought the brand back from Moët Hennessy and appointed industry veteran Dana Chandler as VP/General Manager to run Chopin Imports Ltd. in the U.S. Chandler’s 26 years in the wine and spirits business included positions at Gallo, Kendall-Jackson, Millenium Import Company and, most recently, Russian Standard Vodka. “We will continue to bring forward a luxury, estate-made potato vodka with uncompromising quality and authentic- ity,” Chandler tells THE TASTING PANEL. At press time, a national agreement is Tad Dorda, owner of Chopin vodka. in the works to be signed with a major national wholesaler, and Chandler is ramping up his U.S. sales and marketing team. A small-batch rye vodka is planned for the beginning of 2011. 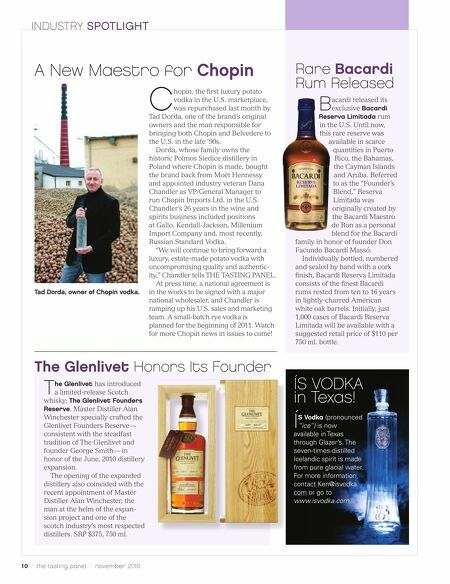 Watch for more Chopin news in issues to come! The Glenlivet Honors Its Founder T he Glenlivet has introduced a limited-release Scotch whisky: The Glenlivet Founders Reserve. Master Distiller Alan Winchester specially crafted the Glenlivet Founders Reserve— consistent with the steadfast tradition of The Glenlivet and founder George Smith— in honor of the June, 2010 distillery expansion. The opening of the expanded distillery also coincided with the recent appointment of Master Distiller Alan Winchester, the man at the helm of the expan- sion project and one of the scotch industry’s most respected distillers. SRP $375, 750 ml. 10 / the tasting panel / november 2010 hopin, the fi rst luxury potato vodka in the U.S. marketplace, was repurchased last month by Rare Bacardi Rum Released B acardi released its exclusive Bacardi Reserva Limitada rum in the U.S. Until now, this rare reserve was available in scarce quantities in Puerto Rico, the Bahamas, the Cayman Islands and Aruba. Referred to as the “Founder’s Blend,” Reserva Limitada was originally created by the Bacardi Maestro de Ron as a personal blend for the Bacardí family in honor of founder Don Facundo Bacardí Massó. Individually bottled, numbered and sealed by hand with a cork fi nish, Bacardi Reserva Limitada consists of the fi nest Bacardi rums rested from ten to 16 years in lightly-charred American white oak barrels. Initially, just 1,000 cases of Bacardi Reserva Limitada will be available with a suggested retail price of $110 per 750 ml. bottle. ÍS VODKA in Texas! 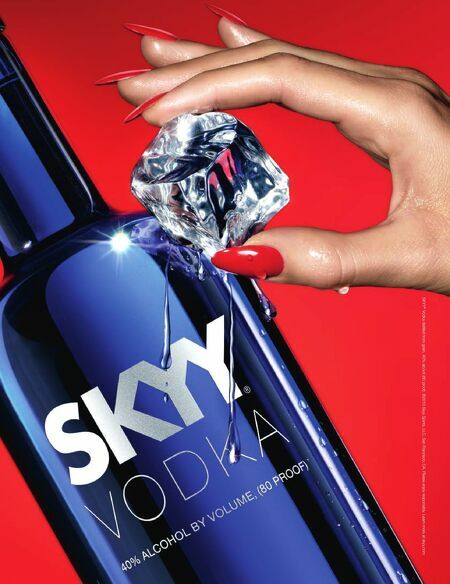 Í S Vodka (pronounced “ice”) is now available in Texas through Glazer’s. The seven-times-distilled Icelandic spirit is made from pure glacial water. For more information, contact Ken@isvodka. com or go to www.isvodka.com.